Hervé Douchy studied cello at the Royal Conservatory of Brussels. While working at the RTBF Symphony Orchestra, he met Sigiswald Kuijken and started playing “baroque cello”, which he perfected with Hidemi Susuki. He then played as a concert cellist with many Belgian and foreign ensembles: "La Petite Bande", "Il Gardelino", "La Pastorella", "Le Concert Royal", "Akademia", "Le Poème harmonique"… and of course "Les Agrémens" where he was the founding member. His meeting with Guy Van Waas was the door opener for a new experience. Since 1994, he teaches chamber music at the Royal Conservatory of Mons and since 2006 “baroque cello” at the Royal Conservatory of Brussels. 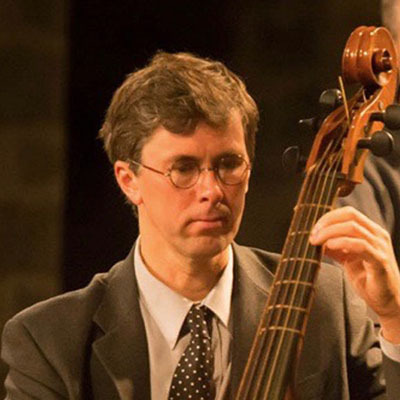 Following his meeting with Marc Vanscheeuwijck (University of Oregon), Hervé Douchy has shifted his approach in his “baroque cello” class, specifically looking to apply practically the theoretical findings. This is reflected in particular through the use of several types of instruments (violin bass, violoncello), played in different positions (sitting or standing, in procession, with a bow holding hand below) with different chords ( 4 or 5 strings). His research is enriched by a close and ongoing 20-year collaboration with the Brussels-based “luthier” Pierre Van Engeland. He plays with several of his instruments. Since 2011, Hervé Douchy regularly plays the Johann Sebastian Bach’s cello suit. In April 2018, he was at the origin of the colloque "Bach et la transcendance" organized by the Louvain-la-Neuve University.